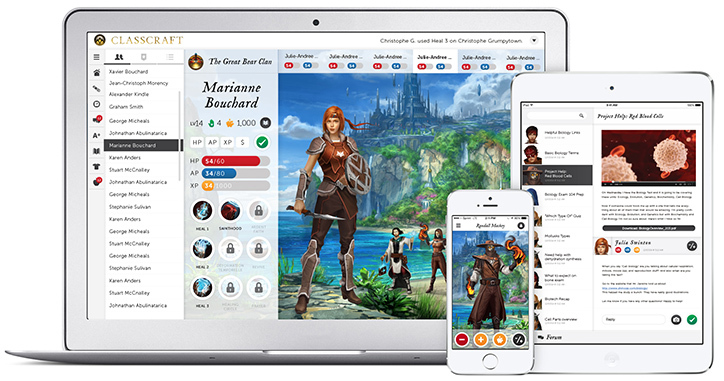 Classcraft is a free e-learning system that transforms class into a role-playing game, based on the theory of the gamification of learning which attempts to make the learning process even more accessible to students (Analysis of Factors Affecting, 2015). It is basically used as a means of managing the classroom and the behaviors of its members (Sanchez, Young, & Jouneau-Sion, 2017; Bicen & Kocakoyun, 2017). Classcraft transforms school by taking the video game mechanics that provide rich and interesting play experiences and applying them to the classroom setting.The teacher is responsible for coordinating the game since he is the game master. A computer and a projector are required for viewing the statistics of the students, while students can view their progress and interact with the content by downloading the application which is available for IOS and Android devices. The game runs in the background during the lesson and it normally takes place simultaneously. The teacher chooses to switch to the game whenever he or she sees that fit or whenever (2015) . These powers represent behaviors and processes that occur within the classroom. For example, the healer's "Ardent Faith" power enables him to confirm a response to a test by asking the professor. In addition, students earn points by answering questions, participating in classroom activities or helping another teammate or even the teacher (Sanchez, Young, & Jouneau-Sion, 2017). Through a variety of activities, students acquire experience points and improve the level of the hero they have chosen initially, thereby improving their own cognitive ability and behavior. It is a tool based on behavioral learning theory as learning through classcraft aims to modify the student's behavior. Additional features that classify it in behavioral learning tools are the specific activities to achieve objectives that activities are designed from the beginning by the teacher (Learning Theories, n.d.). Thus the student is not in control of the application since the teacher is the creator and the one who moves the strings and directs all the parameters of reward or punishment within a course context. As far as the assessment of the learner is concerned, it can be said that it follows the behaviorism model as well since the teacher attributes the possible positive or negative reward with the experience points. Within the framework of classroom management strategies and actions, teachers build a positive ethos within the school unit by recognizing and commending positive behavior and discouraging the unsatisfactory and unacceptable. According to Bretherton, Sim, & Read (2016), Classcraft plays the role of a new behavior system, transforming the traditional responsibility of the teacher. The positive effects on the learning process include the encouragement for learning, cooperativity and student-to-student communication and effectiveness (2015; Bicen & Kocakoyun, 2017; Bretherton, Sim and Read, 2016). Worth mentioning is the flexibility the students have and the freedom of decision-making given due to the fact that the information that is provided to the users about the consequences of their choices can alter their way of behaving (Sanchez, Young, & Jouneau-Sion, 2017). Finally, with the adoption of classcraft as a regulator of the appropriate behavior, students' performance is expected to reach higher standards, aiming not only at the optimal learning culture but also in the improved social life and the extended teamwork that follows (Bretherton, Sim, & Read, 2016). Two different elements are extremely worth mentioning regarding Classcraft. On the one hand the tool is shaped in such a way that it contributes to the improvement of an individual level of the pupil and on the other it introduces social skills and interactive actions, which encourages the establishment of learning communities that can help in achieving common goals. All in all Classcraft, cultivates the development of critical thinking in students, underlining those who believe that games are not just a tool for mere entertainment but they also have huge educational potential (Sanchez, Young, & Jouneau-Sion, 2017). Applications of this type transform the traditional classroom into a learning environment where activities make sense to the pupils and thus create a sense of pleasure under fun situations. Analysis of factors affecting user acceptance of the implementation of ClassCraft E-Learning: Case studies faculty of information technology of Tarumanagara university. (2015). 2015 International Conference on Advanced Computer Science and Information Systems (ICACSIS), Advanced Computer Science and Information Systems (ICACSIS), 2015 International Conference on, 73. Bicen, H., & Kocakoyun, S. (2017). Determination of University Students' Most Preferred Mobile Application for Gamification. World Journal On Educational Technology: Current Issues, 9(1), 18-23. Bretherton, W., Sim, G., & Read, J. C. (2016). ClassCraft in the Primary School Classroom. Proceedings Of The European Conference On Games Based Learning, 167-74. Τεχνολογίας στην Εκπαίδευση, 4(1-3), σ.131. Naismith, L., Sharples, M., Vavoula, G., & Lonsdale, P. (2004). Literature review in mobile technologies and learning. Sanchez, E., Young, S., & Jouneau-Sion, C. (2017). Classcraft: From Gamification to Ludicization of Classroom Management. Education And Information Technologies, 22(2), 497-513.